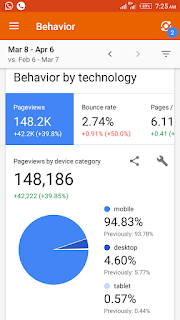 SolutionClass is generating over 1Million page views daily from over 505,000 unique visitors. The website is targeted at Giving School Info To All Nigerian Students. Over 500 users are subscriber to receive notifications of new published articles on our website (a service we launched early May 2017). This is a screenshot detailing our traffic for the month of May, 2017 as provided by Google Analytics – a world renowned analytics service.